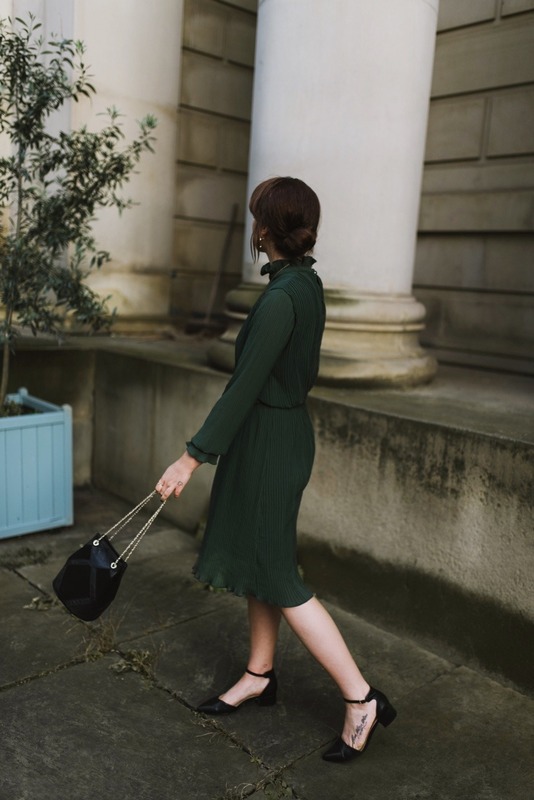 This particular pine green shade is perfect for this time of year because it basically makes you look like an elegant Christmas tree – who wouldn’t be down with that? 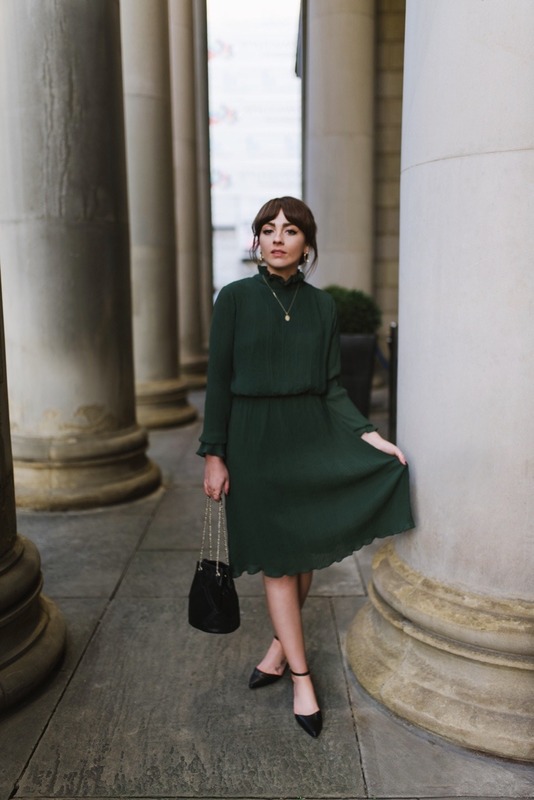 I for one, am embracing the pine green colour in all it’s pleated glory! It happens to be the most incredible shade to pair with gold jewellery too – an added bonus if you’re a gold jewellery obsessive like myself. A simple gold chain bag is my go-to for whenever I want to elevate a simple look – it just adds a certain charm – even more so when red lipstick is added! 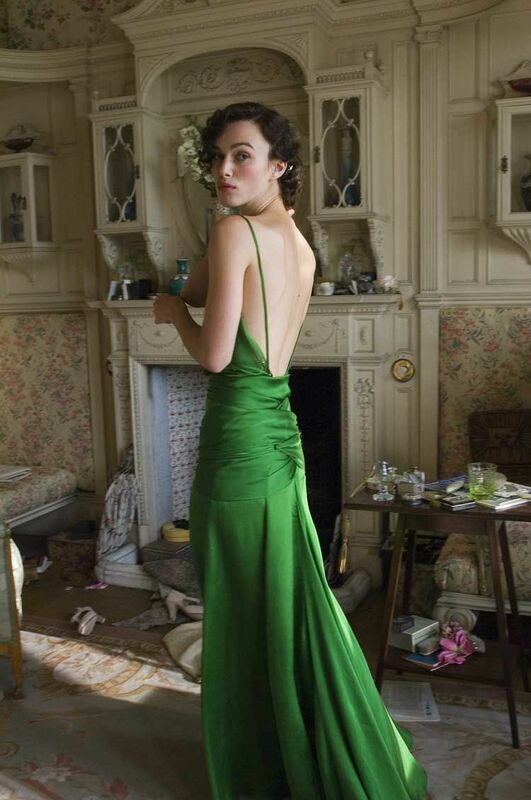 If I could wear any green dress in the world it would probably be the one Kiera Knightley wears in Atonement – I mean just her whole wardrobe in that film is incredible. The minimal green satin design always makes me feel Christmassy whenever I rewatch it, but I definitely couldn’t do the dress as much justice as she does – lets be real. Anyway (I digress), satin is everywhere this season, and I’ll definitely be featuring a few of my favourite satin pieces over the festive period. 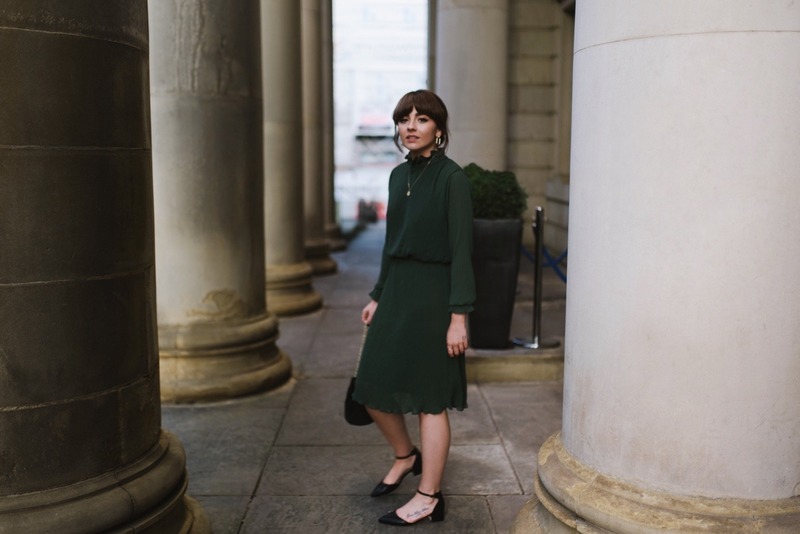 If I could suggest three pieces to be armed and ready with for the festivities ahead – I’d suggest a great satin statement blouse, a tailored pair of trousers, and a midi dress that gives you that magical feeling as soon as you step into it. 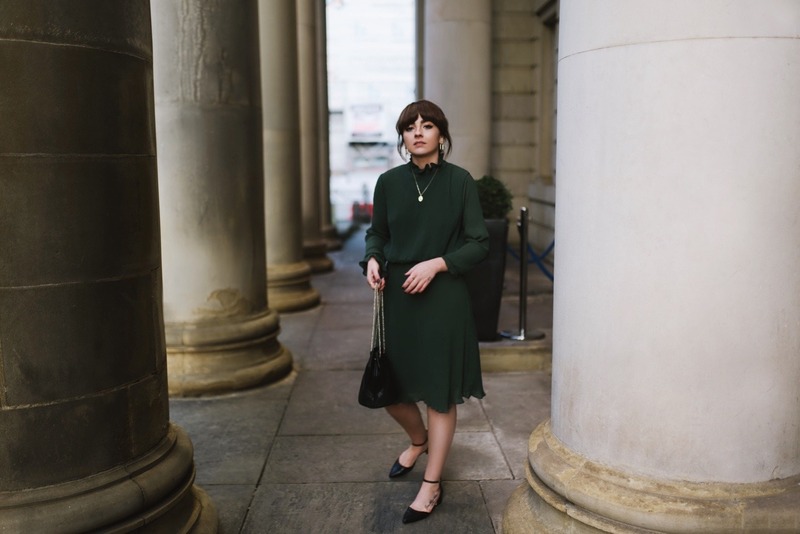 Midi dresses are a godsend because they save me the effort of having to really think out an outfit ensemble when I’m in a rush too – an all too familiar crisis situation that we tend to find ourselves in throughout the month of December. That horrible panic that suddenly looms over you on the way back from work – what on earth do I wear tonight?? 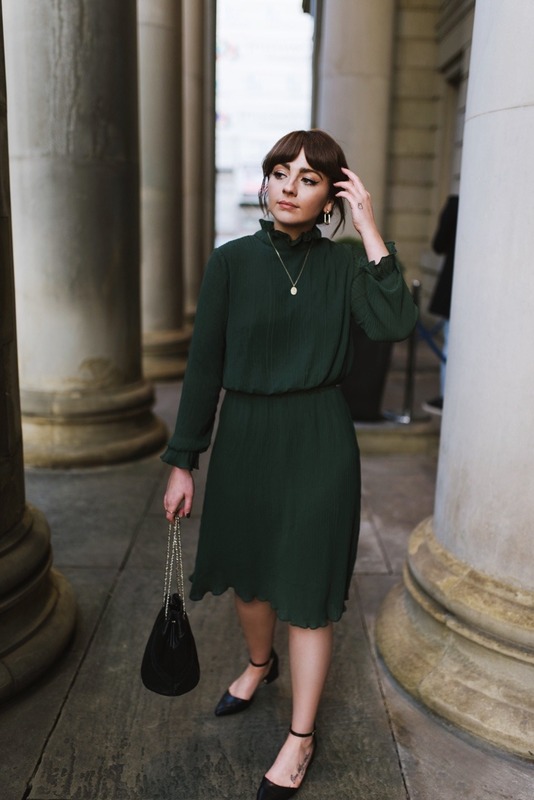 If you can find a midi dress that you feel comfortable in and it fits you well, I promise your last minute wardrobe nightmares will be nothing but distant memories. A midi dress means no tops or trousers involved – it’s a one piece look which leaves you with more time to dwell on the shoes! 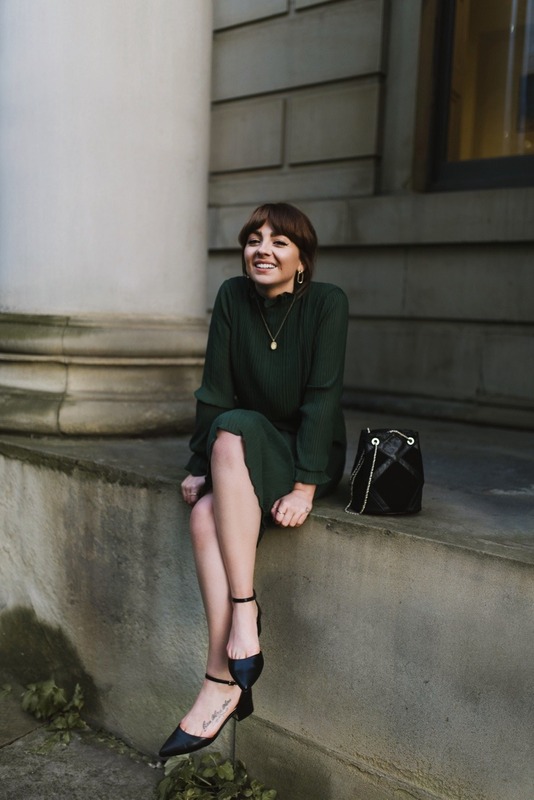 I love nothing more than a pair of pointed ankle strap heels for a more evening look, they elongate the legs and just make everything look a little more polished. I hope you enjoyed this slightly more festive themed post – keep your eyes peeled for many more! 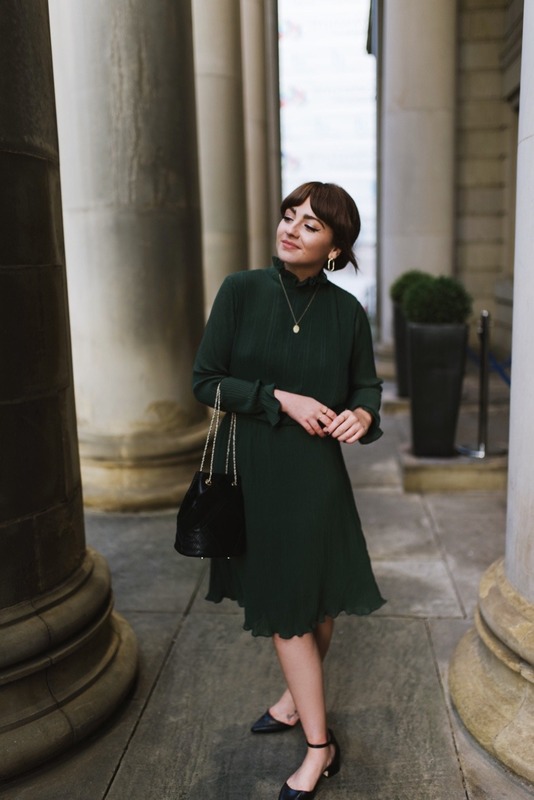 I’ve also linked a round up of the best midi dresses below for you to save you searching all hours of the night. There’s a real mix, and most of them would double up as great New Years Eve options too! You are such a doll! This is a lovely outfit!